I haven’t posted any examples of real estate writing to this point, but I’ve done quite a lot of it, and here’s why: My wife Beth is a Re/Max real estate agent and she has a blog, pinellasnewsboy.com. I’ve written quite a lot of copy for that blog over the past few years, a lot of it under her name. Most of the blog stories have to do with fun or interesting things to see and do in North Pinellas County, where we live and where she works. As with all aspects of my life, I often find interesting or offbeat things to write about. If you just keep your eyes open, you will find all kinds of interesting stories and photo subjects. The fellow mentioned in this story made a big contribution to the war effort back in the 1930s, but he might have been forgotten were it not for a small brass plaque that I found one day while out for a walk. Donald Roebling didn’t have to work, and he could trace that very good fortune all the way back to the Brooklyn Bridge. Roebling’s great-grandfather, John Roebling, was the original chief engineer for the Brooklyn Bridge project, the construction of which began in 1870. But John Roebling was injured at the construction site and had to turn his chief engineer duties over to his son, Washington Roebling. John Roebling died of an infection related to his injury before the bridge opened to traffic in 1883. Which leads us back to Washington Roebling’s grandson, Donald. In the 1930s, Donald Roebling was living a comfortable life in Clearwater, Fla., where he had build an impressive estate on the shore of the Intercoastal Waterway. Then in his 30s, Donald didn’t need to work, but he did share his grandfather’s and great-grandfather’s interest in mathematics and engineering. In the late 1920s and early 1930s, three powerful hurricanes struck Florida. Many people were injured and killed, and many others were left stranded for days and weeks because there was simply no way to reach them through the wreckage and the flooded ground. Donald Roebling read about all the hurricane-related carnage and decided to do something about it. He had a modern, well-equipped machine shop built on the grounds of his estate; he hired a staff of workers; and he set about designing a vehicle that could travel on land was well as through water. Such a vehicle, he thought, could make it through deep water and over blow-downs, and could be used to rescue people should another hurricane come ashore in Florida. Roebling thought the Alligator would make a dandy military vehicle, and he tried to sell that idea to the U.S. Government. Try as he might, however, he could not get anyone to listen to his story. Finally, however, he did get a Life Magazine reporter to write about the Alligator, and that got things rolling. Marine Corps officials saw the article and kicked the Life clipping up the ladder. Before long, Marine Corps officials were in Clearwater, looking closely at Roebling’s creation. They liked the Alligator and thought it would be great for transporting troops from ships onto beaches and then back again. The trouble was that the Marine Corps didn’t have any money that could be spent on research and development of equipment. That didn’t really bother the wealthy Roebling, however; he agreed to do the research at his own expense, and turn out a new version of the Alligator that might make a better application for military use. Within a few months, Roebling’s newer design was approved, and Alligators were being manufactured in Lakeland for the Marine Corps. Not long afterwards, four factories were turning out thousands of the amphibious machines, which saw much action at Guadacanal and throughout the South Pacific during World War II. The machines also were used in Korea and Vietnam, and the modern military amphibious vehicles in use today trace their lineage directly back to Roebling’s original 1930s design. Roebling never made any money from his invention, although he could have. He turned the invention over to the government, refused all commissions and payments, and said he wanted the Alligator to be his contribution to the war effort. He received a number of commendations and awards for his invention, and was even personally decorated by President Truman after the war was over. What does all this have to do with modern-day North Pinellas County and real estate? 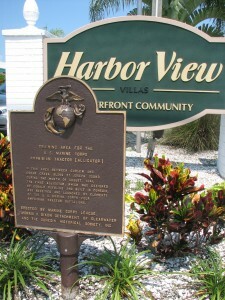 There is a very nice older waterfront subdivision in Dunedin called Harbor View. It was in that area, just north of Cedar Creek, where Roebling and the U.S. Marine Corps tested Roebling’s machine starting in August of 1941. The months spent testing the Alligator in that area of water, beach and woods is what perfected the machine and allowed it to make such a contribution during World War II, ferrying Marines into battle and carrying wounded Marines back to their ships.